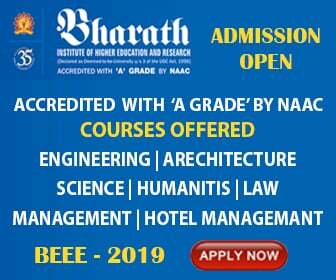 Educational Qualification: Class XII or equivalent (appeared or passed) with compulsory subjects as Physics and Mathematics alongwith one of the Chemistry/Biotechnology/Biology/ Technical Vocational Subject. Candidates should obtain at least 50% in the above combination of subjects. Should appear for either 1st or 2nd JEE (Main) 2019 conducted by National Testing Agency (NTA) else both. In case of candidates who attempt both the JEE (Main), the best of the two scores will be considered by NTA for preparation of final merit list and All India Rank. (In AIT, last year’s last admitted student’s All India Ranking was 1,11,326). AIT admission is based on the All India Ranking obtained in the Joint Entrance Exam (JEE (Main) 2019). All applicants are therefore required to appear in JEE Main 2019, 1st / 2nd JEE (Main) 2019 or both and also apply to AIT for Admission. Failing to fill up any one of the forms will lead to rejection of admission to AIT. AIT does not deal with distribution of JEE Main forms and answering to queries, if any. The applicants should then fill AIT online application on website www.aitpune.com wef 15 Mar 2019 after receipt of JEE (Main) Roll Number of Second Attempt of JEE (Exam seat Number). Details of First Attempt (Roll Number, Mark in JEE (Main) All India Rank obtained etc) are to be filled by the candidate itself in AIT Admission form. Cost of Online application is Rs 1000/-, inclusive of processing charges. Last date for submission of completed Application Form without late fee is 25th April 2019 and with late fee of Rs.1000/- is 05th May 2019.